Disrupting Racial and Ethnic Disparities - AARP NY Reveals Data. 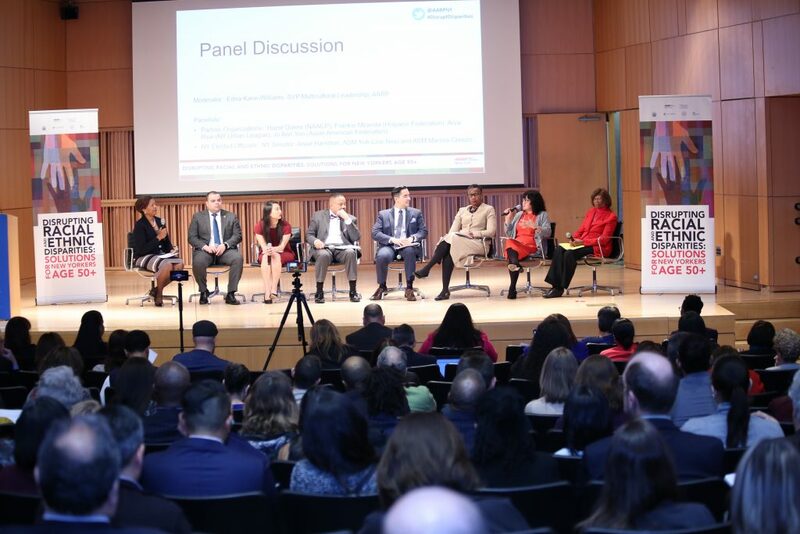 Disrupting Racial and Ethnic Disparities – AARP NY Reveals Data. On January 24, 2018, AARP New York, the Asian American Federation, the Hispanic Federation, the NAACP and the Urban League released a series of policy briefs highlighting disparities in health, economic security, and livability in English, Spanish, and Chinese. AARP and their partner groups have shed a light on the disparities in these communities and have made key recommendations. Few, if any, have led to the necessary policy change to address them; nor have they focused on New York’s 50-plus population. I wanted to share this moment with one of our supporters, Priscilla Hernandez so that she can weigh in for you. I briefly chatted with Catherine Alicia Georges, President-elect of the AARP Board. Ms. Georges, a former nurse, fellow Bronxite and as it turns out neighbor, spoke on how poor health care takes its toll on us older, less affluent POC. I was mightily impressed with her vitality and candid take no prisoners approach. POC older health care workers incur out of pocket expenses more burdensome than their white counter parts. The disparity is staggering. Something else I learned that left me speechless; many of us believe the myth that due to their superior intelligence AAPI will fare better economically. Nothing could be further from the truth. Many live isolated from loved ones. Sadly, this demographic is most apt to commit suicide due to their poor living conditions as they age. For me as a Latina I was struck to learn H/L lag far behind whites in achieving higher education. Lack of higher education translates to poorer paying jobs that don’t yield a sustainable livelihood nor do those jobs provide retirement plans, leading to economic hardship during our most vulnerable years. Those are some of the many issues brought to light at this event that deeply impacted me. I came away resolute in the realization that we need to become more aware of how the discrepancies addressed by AARP and their partner organizations affect us. We need to be more involved in changing policies. The data presented resonated greatly for me. I’m already collecting SSI and can barely get by. I’m one of the lucky few who has family to help me make ends meet. My mother was a city employee for many years. She retired at the same age as me 62 with a decent pension, two fully owned properties and her SSI benefits. But, most of us will not have those to count on. Frankly, without my mother’s help I could very well be homeless. The gap between what is available to me with my modest income and what constitutes a decent living is one of the many reasons I’ve actively researched places to live outside of NYC for the last 2 years. Unfortunately, the landscape isn’t much brighter in other states so I’m on a quest to relocate outside of the USA to help ensure I can live within my means, have reasonable health care and a safe place to call home. None of us want to become a burden. As it stands now it seems many of us will have to avail ourselves of the generosity of others as we age, exactly what we most feared. At this point in my life it’s too late to start saving for that day I thought was far away. From early on we are at a disadvantage. We need easier and better access to higher education and work with retirement pay options. Without those it is difficult to save sufficient funds to get us to live with the peace of mind that comes with having a nest egg. The time to disrupt these disparities is now! I submit these circumstances should be addressed by all of us, not just by the 50-plus population. As older POC in the state of NY we are a rising demographic. “AA/B, AAPI and H/L people age 50-plus now account for the majority (62%) of New York City’s 50-plus population and one third (33%) of New York State’s 50-plus population.” Those numbers will continue to increase. Unfortunately, despite our large numbers we are negatively impacted by scarce accessibility and availability to necessary resources. I invite you to visit aarp.org/NYDisruptDisparities where you can read the policies briefs in English, Spanish and Mandarin. AARP has embarked on a 3-5 years initiative to seek solutions leading to policy changes. 5 Years In… It Is Still About My Three Words For The New Year.